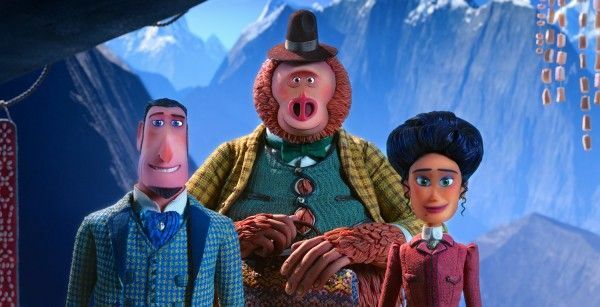 The stop-motion masters over at LAIKA Studios have created another animated masterpiece with Missing Link, written and directed by Chris Butler. It’s the type of movie I’d say you almost have to watch twice; once for the charming story, then a return trip for the pure how-did-they-do-that gawking at the film’s stop-motion wizardry. Missing Link stars Hugh Jackman as the voice of Sir Lionel Frost, an explorer tasked with shepherding the world’s sole Sasquatch, Mr. Link (Zach Galifianakis), to his distant Yeti relatives in the Himalayas. The film also stars Zoe Saldana, Timothy Olyphant, Emma Thompson, and Stephen Fry. While at this year’s WonderCon in Anaheim, California, I sat down with writer/director Chris Butler to discuss the film. Check out what he had to say in the player above, and below is exactly what we talked about. What day one on the project was like, looking at the complex production ahead. Whether he wrote anything in the script that he couldn’t imagine bringing to life as the director. How he stays focused on the humanity of the story while working with such a technical form of animation. The sequence in the film set in a rotating hallway like Christopher Nolan’s Inception. Why he decided to go with a much warmer, brighter color palette compared to his last feature, ParaNorman. What stop-motion offers that no other form of storytelling can do.